This week, United Steelworkers Local 1999 president Chuck Jones publicly corrected Donald Trump, telling the media that while the president-elect claims his deal with the heating and cooling company saved 1,100 U.S. jobs from moving to Mexico, the real figure is 800. Trump responded by falsely attacking Jones, making the ludicrous suggestion that the union president is to blame for American companies shipping jobs overseas, rather than decades of economic and technological developments. Though Jones has been threatened by people identifying themselves as Trump supporters, he said on Thursday that he won’t back off “one iota.” Instead, he used the new round of media attention to point out that the deal struck with Carrier will actually help its parent company, United Technologies, eliminate some of the 800 “saved” U.S. jobs in the coming years. We’re going to make a $16 million investment in that factory in Indianapolis to automate to drive the cost down so that we can continue to be competitive. Now is it as cheap as moving to Mexico with lower cost of labor? No. But we will make that plant competitive just because we’ll make the capital investments there. But what that ultimately means is there will be fewer jobs. Jones has emphasized in every media appearance that he is still grateful to Trump for keeping even 800 Carrier jobs in the U.S. for the time being. He’s also said that he’d be open to working with the Trump administration to save other union jobs in Indiana. (The Hoosier state is still set to lose 2,100 jobs to foreign countries in the coming months.) “When it comes to people’s livelihoods, I think everybody has to put everything aside,” Jones said. Apart from Trump’s tweets, there’s been no official response from his team. But on Thursday RNC communications director Sean Spicer, who’s rumored to be on the short list for White House press secretary, made another false attack against Jones during an appearance on Fox News. He wants the truth. I mean, here you have a guy that talked about Carrier and the importance of keeping the jobs. He picks up the phone, he closes the deal, you’ve got a thousand people that are going to have a blessed holiday season, that are not worried about jobs, that get to spend this time with their family and friends, knowing that they have a job with good benefits. That should be something that’s celebrated. And then you’ve got a union boss that goes out and fabricates how the story went down for no reason. He should be grateful for Mr. Trump and Governor Pence’s efforts to help save those jobs. Instead, the guy whose job it was to actually be advocating on behalf, picks a fight with the president-elect who went out of his way to advocate and fight for a thousand people’s jobs so that they could live next year and the years after it, knowing that they’ve got a good paying job with good benefits. I think Mr. Trump is never going to sit back and let someone take a shot falsely at him without responding. 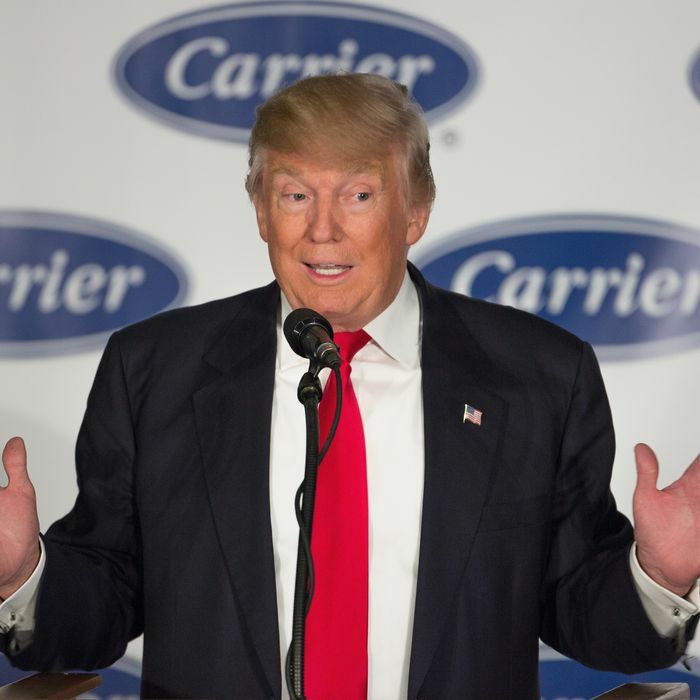 Nothing Jones said was fabricated or false; Carrier has said that only 800 jobs will remain in Indianapolis. Jones had been working for months to keep Carrier jobs in Indiana, as confirmed by President-elect Mike Pence. And again, Jones has said repeatedly that he gives Trump credit for helping some of the Indianapolis workers. So rather than admitting Trump simply misstated the number of jobs saved, a top RNC official repeated an incorrect figure twice and spread more lies about Jones. The union president has said such attacks don’t faze him, even when they come from the president-elect. Jones explained that after working for the union for 30 years, threats no longer concern him — but the same cannot be said of Trump’s other Twitter targets. In light of the president-elect’s attack on Jones, the Washington Post checked in with 18-year-old college student Lauren Batchelder, who told Trump at an October 2015 rally, “So, maybe I’m wrong, maybe you can prove me wrong, but I don’t think you’re a friend to women.” Trump tweeted that she’s an “arrogant young woman” and accused her of being a “plant” from Jeb Bush’s campaign. She’s still receiving vile messages on social media from people threatening to physically and sexually assault her.